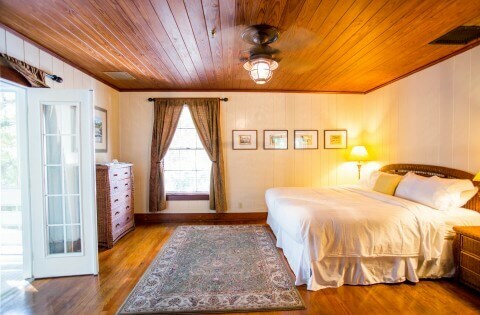 Tucked within the Historic Cabbage Key Inn, you’ll find six charming, and newly remodeled rooms, all of which still have the original, beautiful hardwood floors. These rooms are located down the hallways on each side of the Inn. 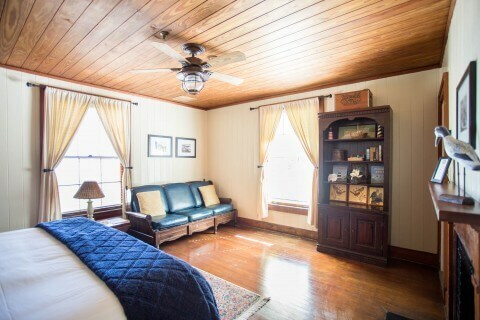 Each room is unique, intimate and tastefully decorated in the old Florida style. All rooms are non-smoking, have air-conditioning, private baths and convenient access to our restaurant and lounge. These rooms do not have televisions, phones or refrigerators. There is WiFi available in the Inn. 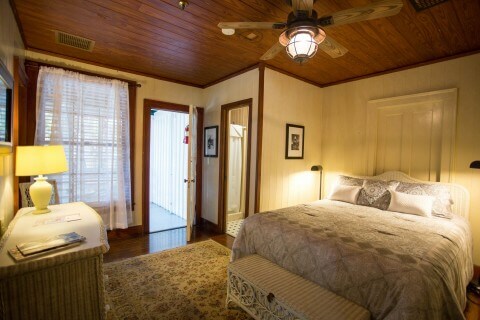 Room number 4 double bed and twin bed bedroom Historic Cabbage Key Inn. All of our rooms vary in style, size and accommodations. The following are descriptions of the rooms that we have to offer. Room 1 offers a king bed, air-conditioning, private bath and a beautiful waterfront view. Sleeps 2 max. Room 2 offers a queen bed, air-conditioning and private bath. 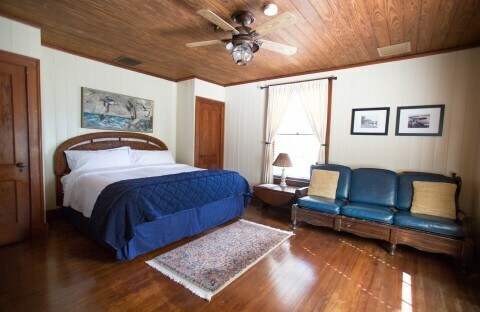 Room 2 remains quaint, cozy and original with its wood floors, walls and ceilings. Sleeps 2 max. 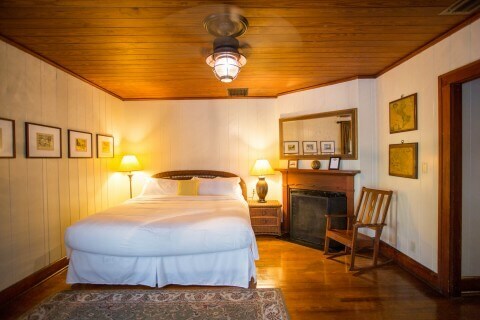 Room 3 offers a king bed, air-conditioning and private bath. 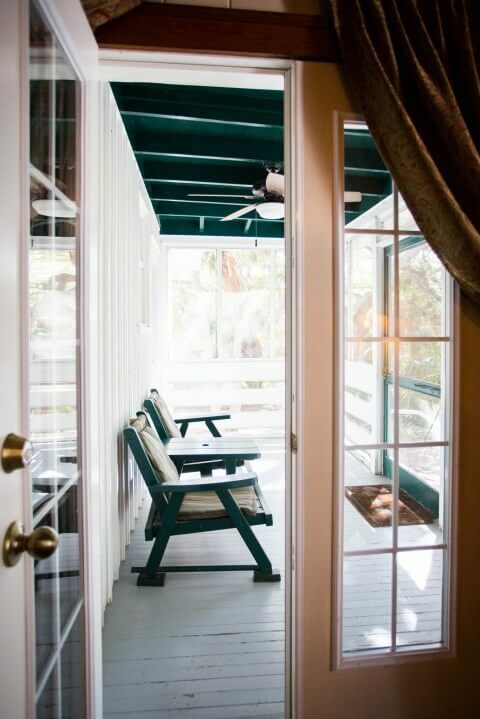 Room 3 is romantically unique in it’s décor with French doors leading out to a shared screened porch with Room 4, offers adjoining door option to room 4 and overlooks the rustic “Old Florida” nature of the island; an alternative entry to the room. Sleeps 2 max. Room 4 offers two beds; a double bed and a twin bed, air-conditioning, private bath and partial water view. 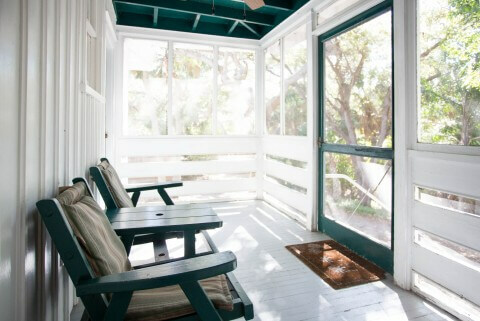 Room 4 is unique in that it has an adjoining door option to Room 3 and also shares a screened porch with Room 3 which overlooks the rustic “Old Florida” nature of the island; an alternative entry to the room. Great for two fishermen! Sleeps 2 max. Room 5 offers a queen bed, air-conditioning, private bath and a private screened porch overlooking the harbor and native foliage views of the island; an alternative entry to the room. Sleeps 2 max. Room 6 offers a king bed, air-conditioning, private bath and a beautiful waterfront view. Sleeps 2 max. Pets: Unfortunately, we have had a number of issues with pets in the past. In consideration of the large amount of natural wildlife and other guests on the island, we ask that no pets other than service animals are allowed on premises. Total Due is charged to your credit card. We just returned from 3 great days at Cabbage Key … We checked into one of the rooms in the Inn. 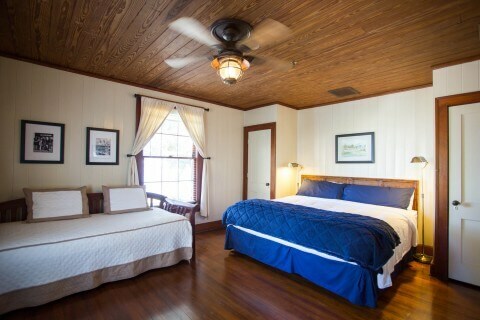 Our room was extremely clean, the bed and linens perfect – – very quaint, albeit tiny. We knew that the room would have no TV so, we brought our lap top so that we could watch Netflix. We spent three (3) days boating and visiting Cayo Costa (a State Park Island only reachable by boat – – bring your beach chairs) and Boca Grande to the north. The beaches on the Gulf side of Cayo Costa are a must see. The Cabbage Key staff were very friendly. They are like family. Amazing retreat away from the hustle and bustle of life! Took my SO for a surprise bday weekend and it couldn’t have been better! We stayed in the “inn” and felt like it was our own home. We were greeted every morning by name by the most friendliest staff ever! They packed us a lunch on ice for a wonderful kayak trip to cayo costa private beach for the day. Dolphins followed behind our kayaks as we travelled between the keys. I and 2 of my business associates stayed 3 nights at the inn. This was the first time any of us have stayed here. We were simply blown away by the service we received, especially by Katie C. She remembered our names (Paul, Daryl and Andy), educated us with her knowledge of the island and the inn, and anticipated our every need. We ate all our breakfasts and dinners at the inn. While the menu was limited, it offered something for everyone, and the food was very good. Each of our rooms were different in size and design, but they were all comfortable and accommodating. I kept my boat at the dock out from the inn and had no problems. This is the best ! The staff were amazing – the bar staff #1. Paula was a great host(ess) and give her 5 stars along with everyone there. The weather turned nasty but the Inn took care of changes and made the vacation relaxing. Menu was great. Back as soon as possible! Kati C, our server was very sweet and attentive. The food was phenomenal. Crab corn bisque? GREAT ! Mahi too. The island is great to explore and perfect if you like to kayak or paddle! Our room was at the inn ( not a cottage) and very romantic and cozy ….